Manuel Espinosa attended the Escuela Nacional de Bellas Artes and the Escuela Superior de Bellas Artes in Buenos Aires, and his first paintings were figurative and very rooted to both anecdote and argument. At the beginning of the 40s, he painted murals and illustrated books. Between 1942 and 1943, he met Joaquín Torres-García and Tomas Maldonado, who greatly influenced him. In the middle of the decade, he remained a figurative painter, centering his attention more on form than narrative. In 1946, Espinosa participated in the inaugural exhibition of Asociación Arte-Concreto Invención (Peuser Hall, Buenos Aires), whose original manifesto he had signed the previous year. He made works with irregular frames and participated in the diverse exhibitions and activities of the group until the end of the decade, when it was dissolved. Between 1951 and 1952, Espinosa traveled to Europe to meet the main representatives of the Concrete Art movement. After his return to Argentina he spent several years assimilating his European experience. In 1959, he exhibited the results at the Galería Van Riel in Buenos Aires, using curved outlines, open or in spiral form, precise or vague , as well as groups of circles, semicircles, squares and rhombuses to construct paintings whose main subject was the creation of space and its contrast with emptiness. At the beginning of the 1960s, Espinosa lived in Spain and Italy. He returned to Buenos Aires in the middle of the decade and participated in numerous collective exhibitions of Constructive Art, including Nuevo ensamble and Materiales, nuevas técnicas, and nuevas expresiones (Museo Nacional de Bellas Artes, 1968). In the latter, he presented three-dimensional acrylic boxes that produced, either by the displacement of the observer or manipulation, diverse optical and kinetic effects. This type of production was displayed again at the Galería El Taller (Buenos Aires, 1969). 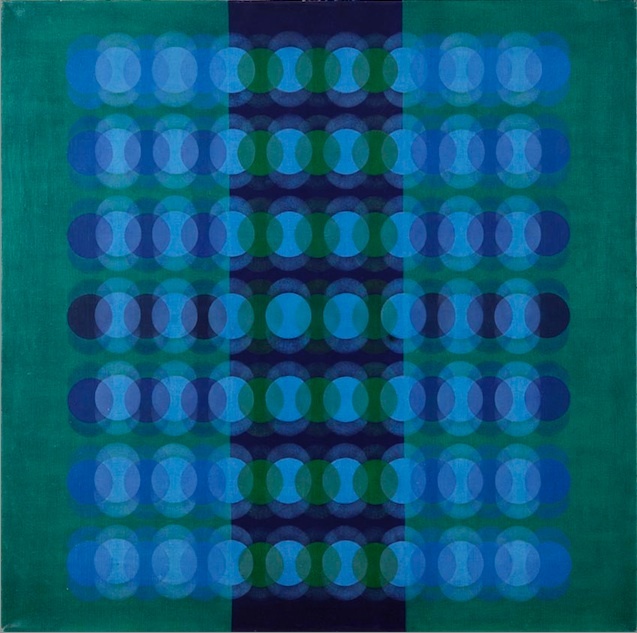 At the end of the 1960s, with his interest in Op Art growing, he began to develop one of his most important series of paintings. These focused on the organization of circles of identical size that, with displacement, chromatic transition, and degradation, produced very active vibrational phenomena. The picture plane became the field for his experimentation and the variations of it in series became his process of work. From the beginning of the 1970s, Espinosa experimented with the square as he had previously done with circles. He displayed this investigations for the first time in tht solo exhibition Pyopen or 20 variaciones sobre un tema (Galería Arte Nuevo, Buenos Aires, 1970). Among several innovations introduced on this occasion was hanging the support from one of its vertices. During this decade, Espinosa presented some exhibitions in which he showed drew inspiration and influences from other arts, including literature and music. He dedicated an exhibition to James Joyce (Galería Vermeer, Buenos Aires, 1977) and another one to Eric Satie (Galería del Retiro, Buenos Aires, 1979). In these exhibitions he continued to use the square form, but with more contrasting colors, and in some cases he subverted the reticular organization or changed the size of the squares. In 1981, Manuel Espinosa was forced to abandon his artistic practice due to declining health. Manuel Espinosa. Buenos Aires: Ana Espinosa, 2012.